Changing startup sound in Windows prior to Windows 7 was quite easy. But with Windows 7, Microsoft took this authority from it users. May be they wanted this version of OS to be known by what the startup sound it makes. But you can still change Windows 7 startup sound. This can be done in two ways. One is manually by changing the system files, which is quite lengthy and can cause OS crash if not done correctly. The second option is just a piece of cake. Below are the steps for doing it in the easy way, taking help of a third-party application called Startup Sound Changer. The file you get is a ZIP file. Extract it and run “StartupSoundChanger.exe” file. Now you get 4 options here. Play: Plays the current startup sound. 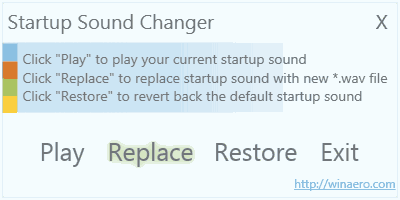 Replace: Allows you to replace the current startup sound. Restore: Restores the original Windows startup sound. You need to click the “Replace” button and select the file you need to use as your system startup sound. You can only choose a WAVE (.wav) file as your startup sound. After all these steps you can restart your computer just to hear your desired startup sound on Windows 7.